As of first of September I’m leaving this city due to job obligations. Yes as of first of September I’m also changing from student life to job life. If all goes well I’ll be a resident in pediatrics in the intriguing hoods of Antwerp, Brasschaat! It’s this fishmonger. But I don’t know how to start to describe it to you. Because it’s not just any fishmonger, it’s like the crème de la crème of fishmongers. It’s not authentic or anything nostalgic. It’s new, modern and hip. The design is crisp clean black. Danny Decroos is the owner and hero of this success story. In 1994 he took over the business. Very quickly he built a reputation of excellent quality and high level of expertise. Danny Decroos has an unlimited love for fish. And this passion is immediately reflected in his shop. When you enter a full team of professionals await you. The fish on display always depends on what’s in season. I love going in the shop. Gazing at the perfect sleek counter, discovering what the catch of the day is. And then creating a menu in your head as you stand there admiring all this beautiful freshness. I have the impression Danny Decroos is as high demanding to his staff as he is to his fish. The people working there know their stuff. They know where and how the fish is caught, they fillet the fish to perfection and give you useful tips to prepare the fish. The atmosphere has something of gastronomic joy. The people that work there and the clients that come here are all here out of love for good food. Last year he started with a 6 series cookbook. Every 2 months he released a new cookbook talking about the fish that’s in season. It’s packed with useful knowledge about the different kinds of fish and every time a different chef from a local restaurant gives away his recipes. I know I’m being totally wrong and breaking all his theories now by posting here a recipe in early June from the book September through October. But in my defense it’s with smoked eel. And so technically it’s not freshly caught. Eel from the Oosterschelde (Eastern Scheldt) is delicate and delicious. World wide one could say the unagi (Japanese eel) used for sushi is best known. In my part of the world however there are two eel delicacies. Stewed eel in a green sauce (Paling in ‘t groen) is one of them. The eel is stewed in a thick green sauce made of spinach, sorrel and chervil. This slight sour stew balances out the rich fatty texture of the eel. The other one is smoked eel. After catching and degutting, the fish is brined during a couple of hours. Next they thread it on a stick, dry it and smoke it by burning woodchips of oak, beech and alder. The result is luscious, salty, unctuous fish infused with a wonderful smoky flavor. In the recipe book “De Vis, September trough October” the recipes are written by Jason Blanckaert. Jason Blanckaert is a young talented chef who works in one of the best restaurants in Belgium I think. C-Jean is located in the heart of Ghent, right next to the famous three towers of Ghent; this restaurant has minimalistic design in a historical house. In 2007 it received its well deserved first star from Michelin. They are innovative without the overkill on foams and molecular cooking that you see so often nowadays. They start from a classic dish and turn it into a modern masterpiece. The recipe that was in here with smoked eel is wonderful. It’s an unusual combination but I have never tasted anything that complemented the different tastes so well. Jason Blanckaert serves smoked eel with stinging nettle bread and ‘Oude Reypenaer VSOP’. 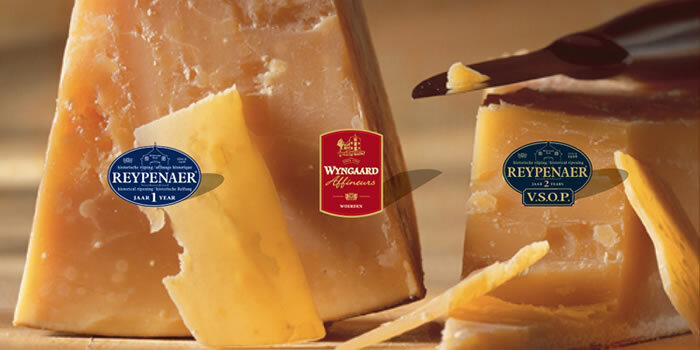 (picture from www.wijngaardkaas.nl)Oude Reypenaer is the Beluga of the Dutch cheeses. Aged for 2 years in a 100 year old storage house, this Gouda has the most delicate taste. It’s not dry and crumbly despite its aging process; instead it’s unctuous and has a sensational taste. And it’s perfect with the smoked eel, both are rich but somehow it doesn’t become over shooting with richness, it becomes ultimate balanced richness. In the recipe Jason Blanckaert adds a mousse of sorrel to turn back to the traditional ‘Paling in t groen’. I slightly adapted his recipe. Instead of using stinging nettle bread, I use sorrel bread. Partly because I didn’t want to end up with stinging burns, partly because I thought instead of using the sorrel in a mousse on the side why not put it in the bread. The result is perfect topped of with some young green salad dressed with sherry vinegar. It’s a real jaw dropper as amuse bouche! Enjoy with a crisp cold glass of Pinot Grigio as my father loves it. I used just my standard white bread recipe and added the sorrel add the end. You might want to use a little less water. Cook the sorrel and drain. Puree in a blender. Let it cool down. Dissolve the yeast in the water. Mix with the flower. Add the salt. Finally add the sorrel. Knead thoroughly. Let it stand for about an hour until doubled in size. Knock the air out and put it in a baking dish. Let rise for another hour. Bake in a preheated oven of 200°C for about 45 minutes. Lightly toast the sorrel bread. Mix the salad with sherry vinegar and olive oil and season to taste. Assemble the amuse bouche by layering the toast first with the cheese, then the smoked eel and finish of with the salad. awesome stuff. Love eel, especially smoked. Never seen sorrel added to bread before, and now want to try it badly! you really should try the sorrel bread, I think it gives a very interesting taste and texture to the bread! Not to mention the amazing cool colour! Kind of like sourdough bread but better. Had it with Iberian Ham the other day and worked well too! If I made the dough in the bread maker do I add the sorrel at the end when needing ? and shaping into rolls ? I have absolutely no experience with bread makers. I would suppose you add it like you add water to your bread. Next story One!!! Scrambled eggs with shrimps and french toast with salmon.